We are so ahead of the trend curve here at Fire on the Greenway. We are making one of the hottest products right now and none of us even knew it. Check out the full article on the New York Times. You see them in trendsetting boutiques like the Primary Essentials in Brooklyn and Still House in Manhattan, artfully arranged in window displays and on shelves like totems of good taste. They can be spotted in the stylized pages of Kinfolk, Apartamento and other cult magazines, often paired with organically shaped cutting boards and sun-dappled potted succulents. Vogue even devoted two pages in this year’s September issue to a new wave of independent ceramists. And among certain creative-minded millennials, ceramics have replaced jewelry and furniture made from salvaged lumber as the craft du jour, with access to choice kilns as a status symbol to be flaunted on Pinterest and Instagram. 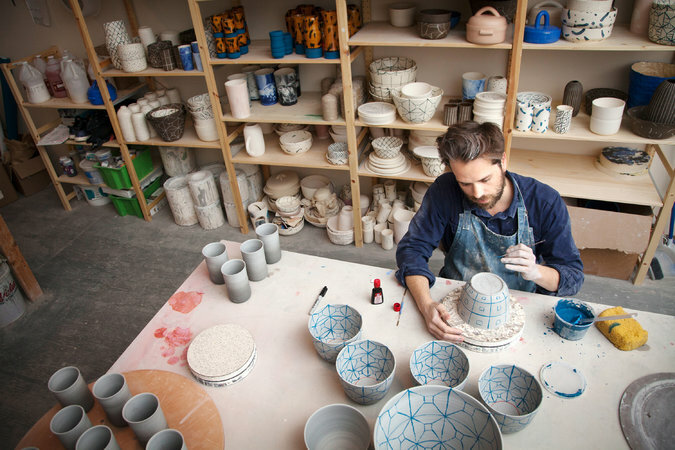 “There is beauty in imperfection and having items that are really handmade,” said the fashion designer Steven Alan, who populates his boutiques with textural American and Japanese ceramics in neutral hues. While terrariums, Edison bulb light fixtures and fixed-gear bicycles have all enjoyed moments of demarcating cool, handcrafted small-batch ceramics are suddenly the accessory of the moment. This entry was posted in: News! A part time potter, full time marketer, full time puppy father.